Vacation rental lodge. Sleeps 2, 0 bedroom, 1 bathroom. No pets allowed. The Pineapple gulf front units are one room studio units that have a large picture window view of the gulf and a great view from your balcony as well. 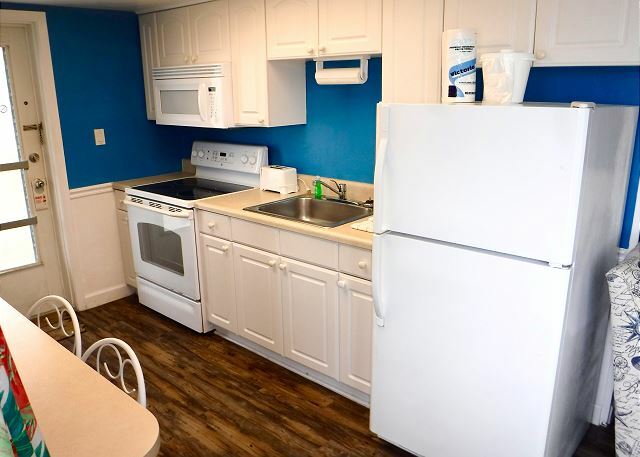 Both units are freshly decorated with relaxing island décor and include a fully equipped kitchen with a full size refrigerator, glass top stove and coffee maker, breakfast bar, relaxing recliner, and double vanity. 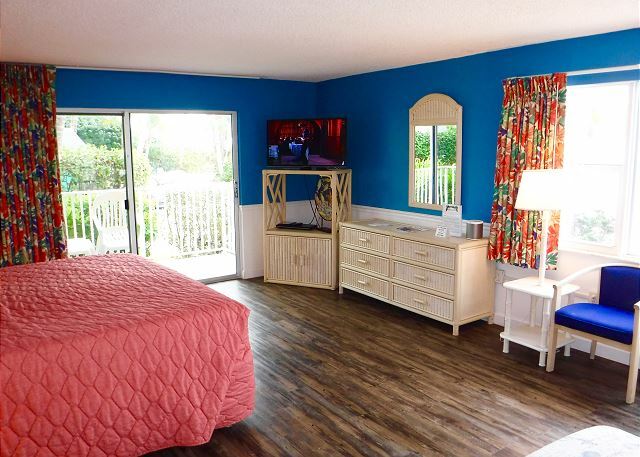 The unit includes a king bed, 32” flat-screen TV, DVD player and free Wi-Fi. Each unit is approximately 426 square feet. First and second floor units are available. The Waterside Inn, previously known as The Snook Motel, is so dear to my heart. I have been a guest at this resort for 30 + years and I hope to enjoy 30 + more years. The Waterside Inn is where I come for joy and happiness, or if I need peace & serenity from my fast paced life. It has been a privilege to have the Waterside Inn in my life. Over the years, Sanibel Island has changed. It now has many condos which stretch along the beaches and surround the Waterside Inn. The Waterside Inn has been that one “shinning place” that has never lost the charm and beauty that is the true feeling of being on Sanibel Island. There are many guests like myself who have been coming to what was first known as The Snook Motel, and later, The Waterside Inn. Most of us have been coming more than 30 years. We all hope and pray that this little “Slice of Paradise” which looks and feels like the “true Sanibel" will remain intact for many years to come. The Waterside radiates warmth & charm, it offers you bright & cheerful colors, and most of all, it provides you with an intimate vacation experience. Once you stay here you will know what I mean. The staff is professional, warm and friendly, and they make you feel at home. Some of the staff I have known for years, like John, who maintains the grounds and cottages and makes all the guests feel like they are part of the Waterside family. When you talk to John, you can clearly see that he also feels the same respect and love for this resort - just like all of the many loyal, long time guests. I highly recommend the Waterside Inn and its entire staff. Property accurately described on website. Reservations handled professionally. Wonderful views of the Gulf and sunsets from this unit. All management and staff very friendly and helpful. A delightful stay. Pineapple 128 did not disappoint. I had inquired about a quiet, peaceful and safe place for a few days alone. It really was awesome! Nice room, comfy bed and quiet! The only thing that could have made this any better was an elevator since I do not pack light :). It was beautiful! For over 30 years I have been staying at the Snook/Waterside Inn and that is because it looks like Sanibel! Warm, colourful, personal, and homey. The staff is the best and 128 is more my home than my actual home. We booked our vacation in Jan 2014 after much research on beachfront stays in Sanibel island. We walked in and fell in love with the place. It was more than clean & the view was to die for. I would highly recommend, we even stayed an extra night it was so amazing. You are about 150 ft from the ocean. Enjoy!!!! Good service, helpful staff. Only difficulty was the air unit. Too loud, could not sleep. Would stay there again, great access ! We recommend highly. Great management, gorgeous views. Be sure to bring all your groceries with you. 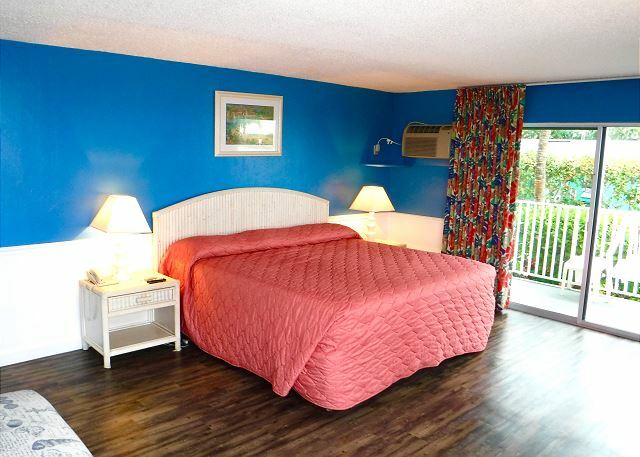 The Waterside Inn On The Beach is a perfect, no-frills place to stay on Sanibel Island. We stayed in Pineapple Lodge #128. While the decor is dated, it was certainly clean and well-maintained. #128 has the best view of the ocean from the Pineapple Lodge - the top floor and window directly overlooked the beach. The parking spot assigned to #128 is directly next to the stairs to the room which was very convenient. During our stay, we walked the up and down the beach and Waterside easily has the best beach. The staff was extremely pleasant and accommodating. We truly enjoyed our stay! stayed at the waterside inn pineapple 128 in mid-june and had the most relaxing trip imaginable! 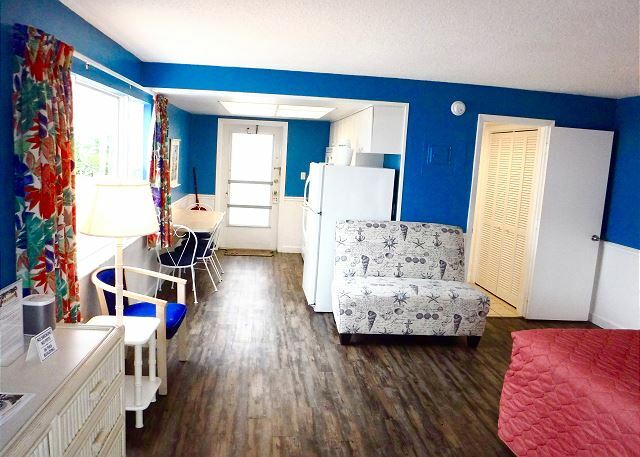 the room was just steps from the beach and offered great gulf front views! the check-in was super friendly and courteous and navigation to the room was a breeze. the beach was more relaxing and a lot less crowded than the MD and NJ beaches nearby. well worth the trip. the grounds were really clean, quiet, welcoming, and just what we were looking for!. we'll definitely be back! We've often stayed at Waterside Inn and have loved it every time! This is the only place we stay when we come to Sanibel Island and don't plan on staying anywhere else during future trips. Two years in a row and we're booked for next year! 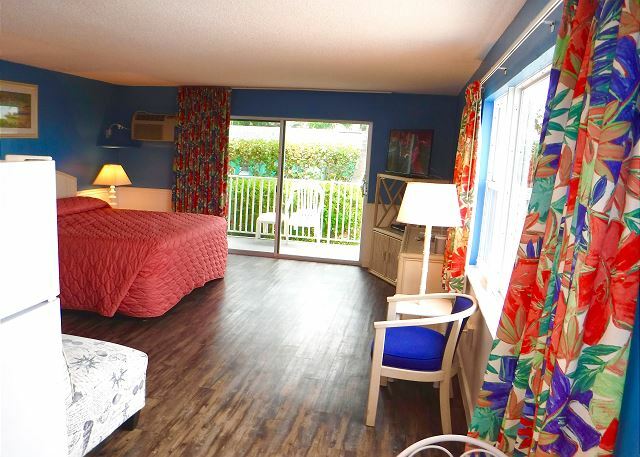 Very clean, quiet, and comfortable... Love the proximity to the beach! 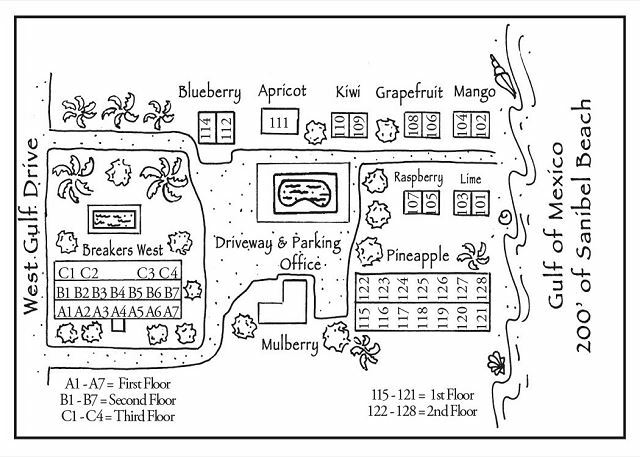 We stayed in Pineapple 128 with a great view of the beach & ocean on the second floor. The room was very comfortable & clean. We had the windows open at night so we could hear the waves on the beach. The pool was relaxing when we wanted to get out of the wind on the beach. On Friday evening the staff hosted a light snack & drink reception near the beach. I would return. Would have liked a little more room around the toilet in the bathroom. the rest of the stay was great. Great location. We loved the site. Short distance to the beach. Easy parking. Excellent service. Beautiful view. Close to stores and away from the high traffic areas. Great room and a new bed. Couldn't be better. We have vacationed at this facility for many years so, obviously we like it very much. Owners and maintenance personnel are very helpful. Great place to unwind and celebrate Christmas. Great shopping opportunities, if desired, and lots of good food on the island. We plan to return. Excellent rental property. Attentive staff and clean accommodations. We stayed in the Pineapple Lodge for 9 glorious nights! The room was very clean, the bed very comfortable. We are very picky about the beds and usually are longing for home after a few days but this was great! The staff was super friendly and so helpful! The shelling here was superb! You can see the sunrise in the morning and the sunset in the evening making this the perfect location. The beach was clean except for all the perfect shells! They have a great little shell station so you can clean your shells before packing them up to take home. The room was very spacious and clean. Housekeeping did a great job every day. We love it here at Waterside Inn and will be back! A lovely place on a lovely island. We have spent our fall vcations there many times and especially love the view out of the window of #28. If we have one purely personal desire, we wish they would bring back the twin beds instead of the high king size single bed that replaced them. Calm and quiet atmosphere. Relaxing beach walk with sunset view upon the shimmering Gulf water. Very clean, great view, private beach. Only issue was water pressure in the shower. It is the perfect place to enjoy sanibel. A Great Get A Way! Waterside Inn On The Beach is a great little get away on Sanibel Island. This was our first trip to Sanibel, and we stayed in Pineapple 128 which was great....Perfect view just steps from the beach. We plan to stay at the Waterside Inn again, and have already told all our friends they should definitely try it out for themselves.